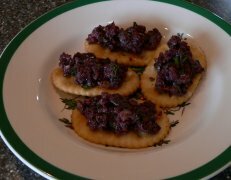 Kalamata Olive Tapenade Appetizers are gourmet canape without the fuss. Try pairing with a glass of Chardonnay for a real treat. Very easy to make and your guests will love it. crusty baguette slices, toasts or crackers. This is a very easy and quick recipe. With a little more fuss, try adding roasted garlic and bell peppers to the mix. You will come up with a very interesting and delicious flavor. Put first 5 ingredients in mini food chopper and coarse chop. 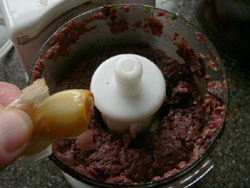 If you prefer a paste, blend in food chopper longer until you reach your desired consistency. I prefer it coarse like my picture.